"Effortlessly charismatic. A natural compere" (Greg Cook). “ …with his cheeky charm and quick-wit, Alan had the audience in the palm of his hand. His combination of sharp gags and brilliant banter ensured that a big laugh was never far away." (The Wigan Courier ). Salford-born comic Alan Donegan has established himself as one of the finest and most versatile comperes on the North West comedy circuit. Since 2006, Alan has been honing his stagecraft at the comedy clubs in Wigan, Preston and Manchester which he promotes and is resident compere. He has also recently gigged in North Yorks, Lincoln, Shrewsbury, Liverpool and Chester. His amicably cheeky charm, brilliant banter and razor sharp wit is perfectly balanced with a natural ability to command the attention of the audience. 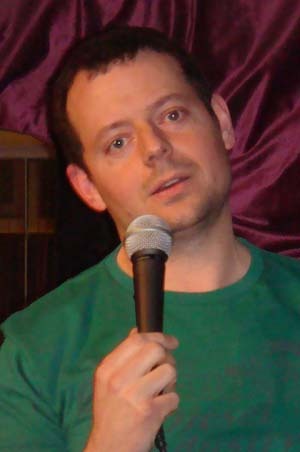 Alan's reputation for his inspired improvisations with the audience allow for a unique compering experience. Alan promotes and hosts a variety of comedy clubs across the North West, sharing regular stagetime with some of the UK's top stand-ups. Alan is currently building a cult following for his engaging persona, original insights and clever gags. His off-the-wall style combined with his ability to adapt to any audience combine to create a tried and tested formula that produces laughs from young and old alike.